I went to the Smart Care Doc and so far it looks as though there is one in Pennsylvania that is on board so far. A registered nurse greets the patient and guides them through the process. 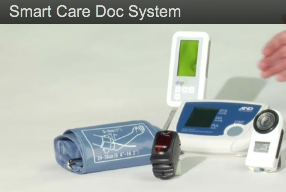 The doctor comes on line via the screen and conducts a medical visit. The site also has a listing of the conditions the clinic can treat. The video below does a short walk through. You can see the patient using the devices and a medical record is created and the patient has access and can get a copy on the way out. Dubbed Smart Care Doc, this technology, provided by BCS Global Networks Limited and Telemed Ventures, will enable remote video consultations between a patient and doctor through a virtual face-to-face video interface, over a secure video network. Users of the service have the ability to conduct telepresence-quality face-to-face interactions over the Internet using existing laptops, smartphones or tablets – making it a very affordable and accessibly solution for patients, doctors and healthcare providers. Patients receive all the benefits of a traditional doctor’s visit that they’ve come to expect: the ability to see a doctor instead of a less experienced practitioner, engaging the doctor in a face-to-face dialogue about medical issues, predictable/transparent pricing options, and the accurate acquisition of vitals and health information.